As I walk to my tent at the edge of camp, my vision is elemental, full of shapes without fine details. Shifting slabs of moon-glow keep rearranging trees as if they are pieces on a giant pearled chessboard, their trunks whitewashed the color of ash. I enter my tent, zip it shut, and switch on the lamp. The electricity comes from batteries charged by solar panels on the other side of camp, carried by a line buried several inches below the sand. Not long after, I turn off the light and crawl into bed. I roll on my back and blindly stare at the black canvas ceiling of my tent, looking back at the bright moments of the day. But then an unexpected memory darkens the darkness. In 1996, on my first trip to Africa, I was in a carload of tourists rounding a corner on a sandy road in an area of Zimbabwe where elephants were recently massacred for their tusks. We rounded the corner and stopped – face-to-face with a huge matriarch. Richly repulsive, an unnatural, confined scent rose from us – odors of food on our clothes and in our hair; flowers washed in alcohol dabbed behind our ears; dead skins around our waists and on our feet; grease, oil and exhaust from our vehicle. 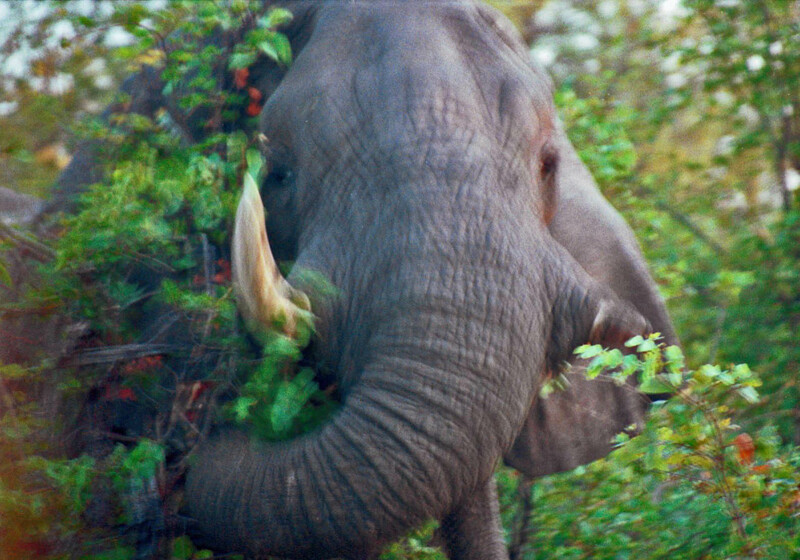 With her trunk shaped into a “J,” the elephant sampled the waves of scent emanating from us, and then tossed our smell away with an emphatic flick. Unnerved by our overpowering human stench, a miasma with a deadly history, she turned and fled, while the half-shadow of dust that marked her exit collapsed to the ground. The air around me tightens. Canvas walls crowd in, closer, and then closer. What if our days were measured in scents rather than minutes? What if we could tell the difference between a friend and a murderer with just one sniff? I nominate you for the Blogger Recognition Award and One Lovely Blog Award. I love your blog! Thank you Kim! I’m honored that you nominated me. And glad you love the blog. My goodness! That gives one something to think about – how much we pong! Pong? is that a word I should know? How much we smell – certanly something to think abut when we get reactions from animals. Pong = smell? Is that a slang word? No, I think it is a name given to the British by the Australians! Hi Cheryl – this is yet another brilliantly written piece. It had me on the edge of my seat, and reminded me of the expression: “I can smell them out.” Thank you for consistently arousing my imagination with your very inspiring writings. Love and hugs. Thank YOU Gil – and for the gift of your friendship. I bless the day I met you. Thank YOU, Cheryl.